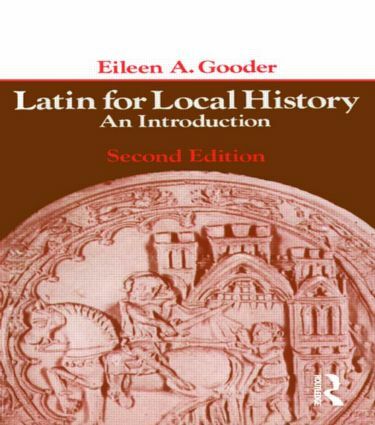 Latin for Local History provides a self-teaching guide for those historians who wish to tackle the language in which the majority of pre-eighteenth century historical records have been written. It is unique in dealing only with Latin found in historical records of the medieval period. Practice material and exercises are provided in the form of documents most commonly encountered by the historian in their research - deeds, charters, court rolls, accounts, bishops' registers and so on. 9. Qui, que, quod; second conjugation;habeo. 10. Third declension nouns and adjectives. 11. Fourth and fifth declensions. 12. Participles, past and future, formation; use of future participle. 13. Future tense; ego. 14. Past (perfect) and future perfect. 15. Present and past participles; ablative absolute. 16. Comparision of adjectives and adverbs; verb 'to be' court rolls. 17. Passive verbs; deponents; semi-deponents. 18. Infinitives; accusative and infinitive construction. 19. The subjunctive; formation and uses (1). 20. Uses of the subjunctive (2). 21. The gerund: formation and uses; the gerundive: formation and uses (1) and (2).